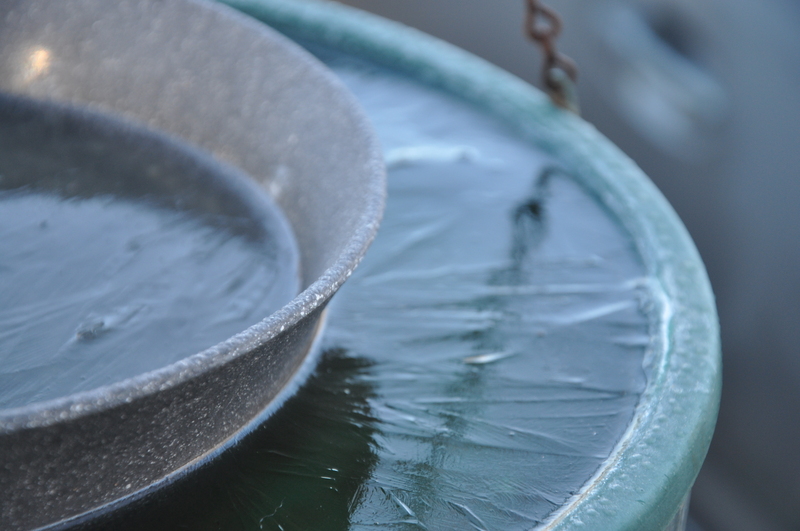 The weather forecasters say it’s too early to cry “drought”, but it’s shaping up to be a dry, warm winter. San Jose’s climate is semi-arid averaging a mere 15 inches (38 cm) a year. Most of our rain falls between October and March. As we head into mid-February, there isn’t a drop in the forecast. It’s also been unseasonably warm. 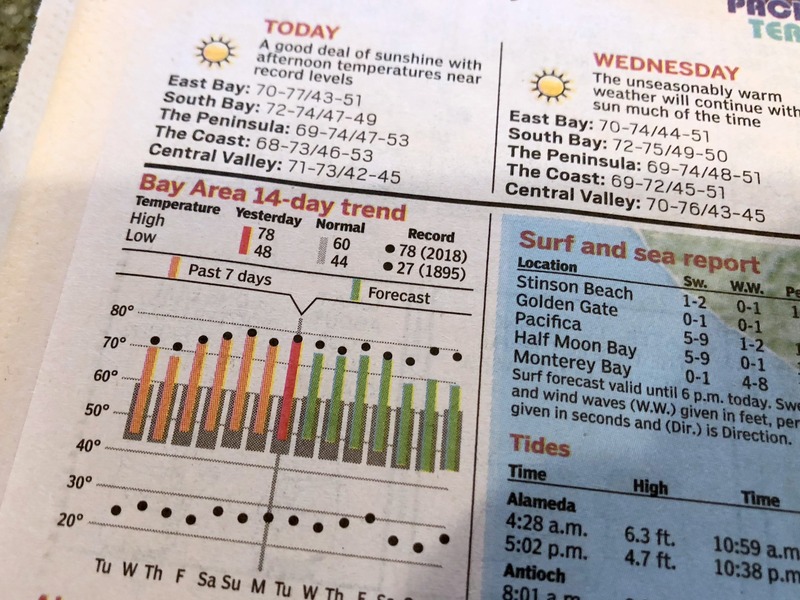 Source: San Jose Mercury News The black dots represent record highs and lows for that date. As you can see we’re near or over those records. It might seem uncharitable objecting to a series of warm, clear days when it would otherwise be cold and windy, but after a year of brutal wildfires, these conditions do not bode well for the months ahead. We shall see. This morning I spotted a self-seeded tomato that has already shot up in one of the planting beds. I wouldn’t normally plant tomatoes before April. It’s all a bit surreal. 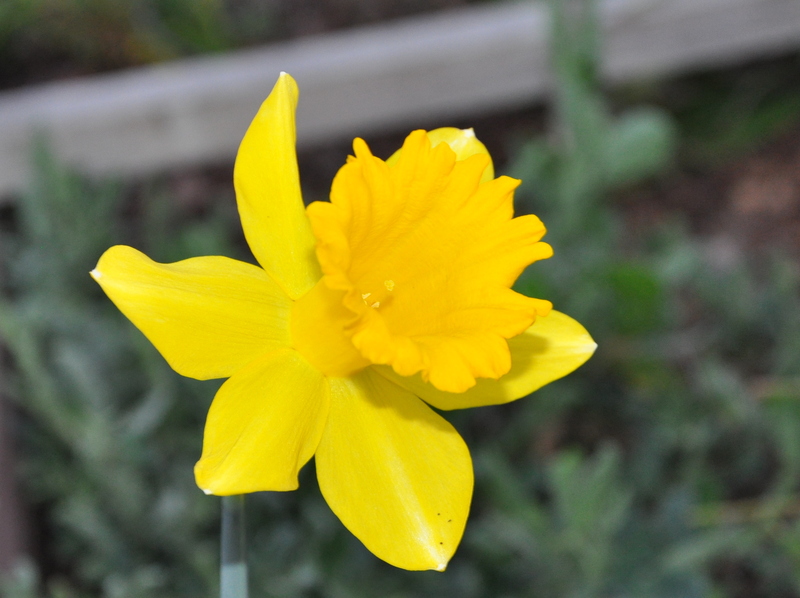 The daffodils (narcissus) are coming up. I can’t think of a more cheerful flower, breaking ground with their strong, green stems, then unfolding their yellow perfection. I play a little game with myself in November. I buy a few bags of bulbs, then plant them in random pots, beds and corners of the garden and forget about them. 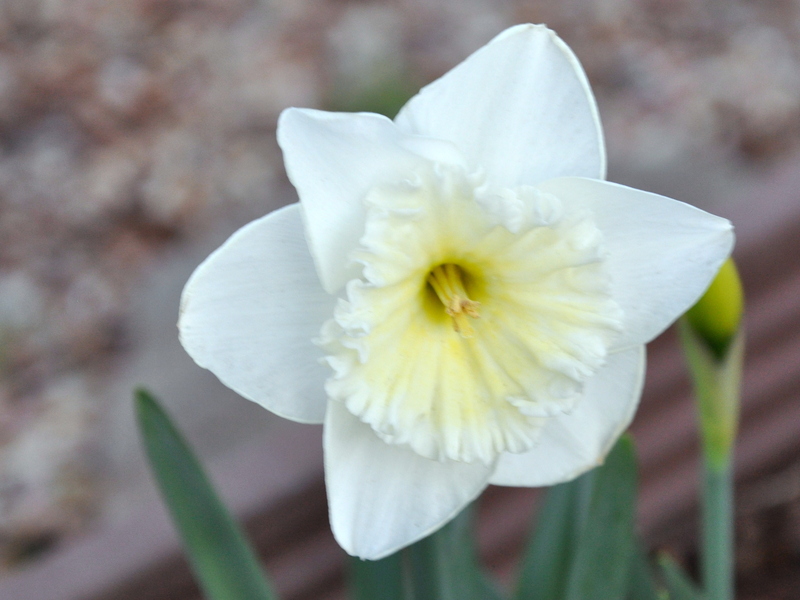 I’ve learned over the years what grows well (daffodils, iris, Calendula, hyacinth and freesia) and what to skip (tulips). 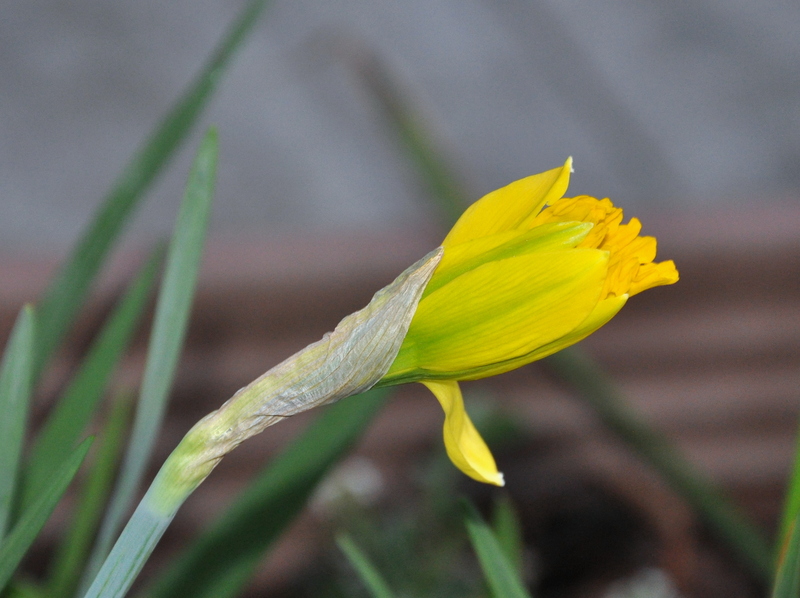 Daffodils survive because they’re toxic to squirrels. They leave them planted deep in the ground. The freesia do an amazing job spreading each year, producing bigger and more productive plants each season. 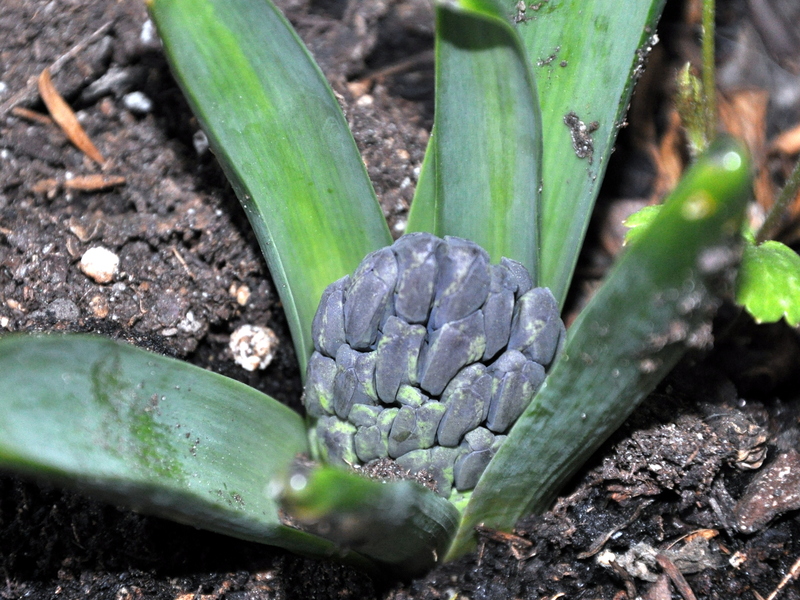 I added to my hyacinth bulbs last year and they’re coming up in succession instead of all at once. They’re intoxicating. 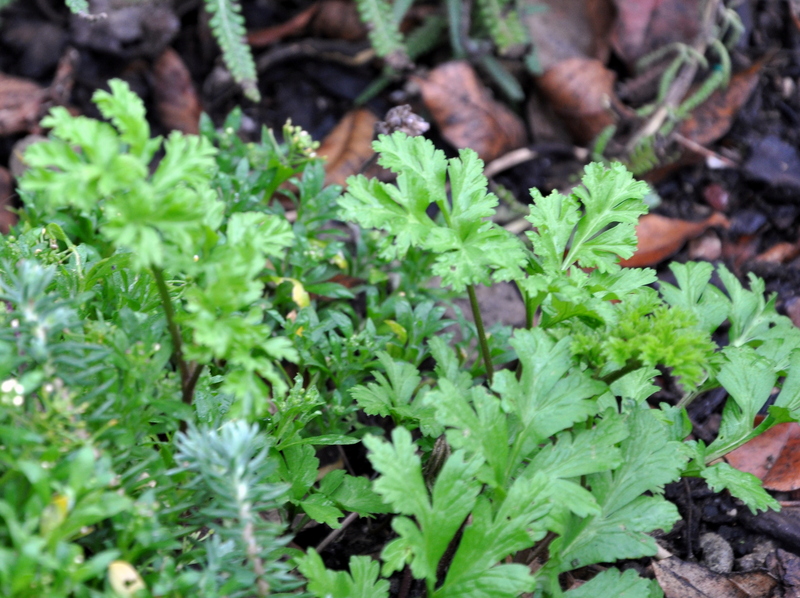 A year ago I planted Ranunculus. The name comes from the Late Latin term for “little frog”. I had mixed success. They are so pretty, that I gave it another go. The first year, the squirrels kept digging them up and tossing them on the deck. They were interesting enough to unearth, apparently, but not good enough to eat. Last fall I planted them after filling one of my Earthboxes with cyclamen and (name escapes me) a white trailing plant. That did the trick and they’re all up in beautiful, leafy plants. One of the simple pleasures of gardening is the ever-changing landscape. 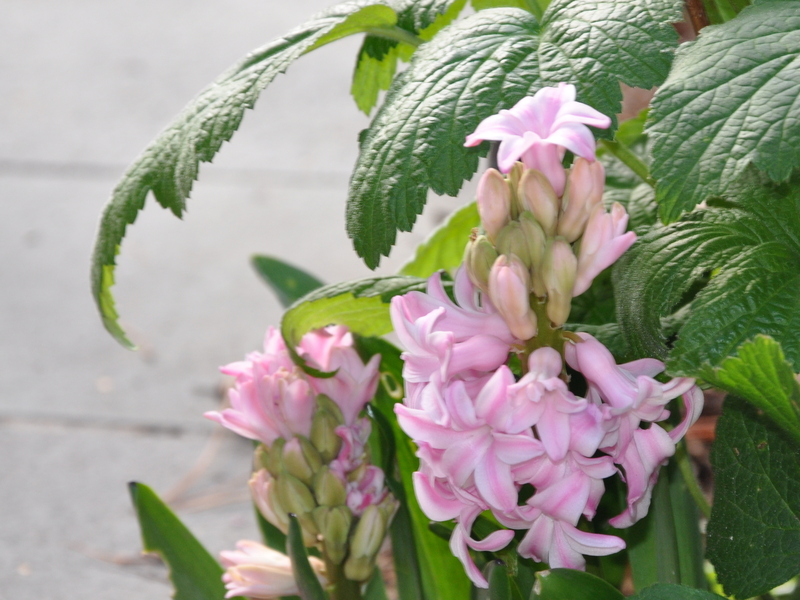 No two plants are alike and no two seasons are quite the same. There are happy accidents everywhere, helping balance the ever-present and predictable weeds. San Jose summers are hot and long, but occasionally nature serves us a reprieve. I relish those days when the stars align and I have both the time and the weather to spend outdoors getting things done. Of all the things you can grow in a small garden, pumpkins are among the most spectacular. It seems you can witness the change every day. Within 90 to 100 days, one healthy seed can sprout, grow, flower and fruit, trailing across the landscape at amazing speed. A couple of pumpkin seeds took root in our narrow and shady side yard, with one of those two vines traveling the length of the house and eventually rounding the corner. That vine is now winding its way across the patio. With leaves the size of a platter and flowers as broad as your hand, watching pumpkin plants grow evokes a certain optimism and joy. 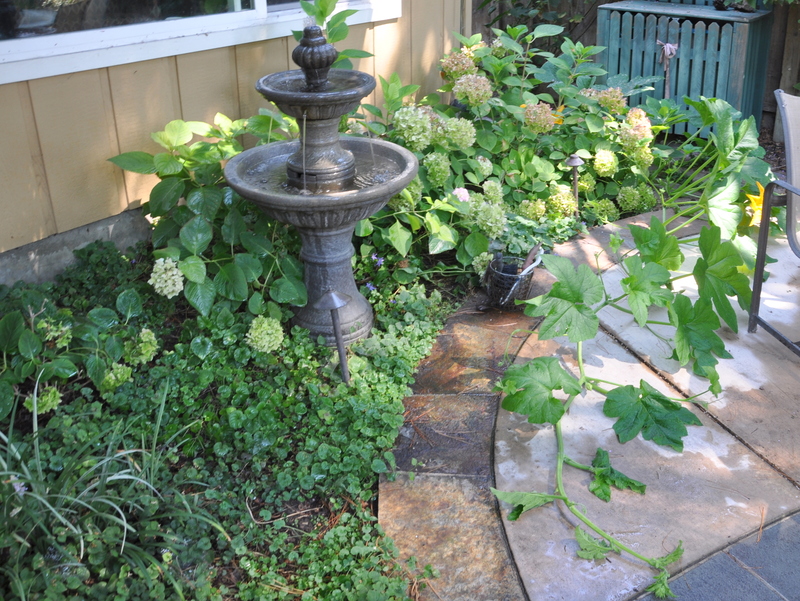 Years of drought brought about many changes to our garden. It started with the removal of the “grass strip” between our sidewalk and the street. My husband grew up with spacious, green lawns. His reluctance to remove the lawn took some time to overcome, but in the end we replaced all of our lawn with native plants. 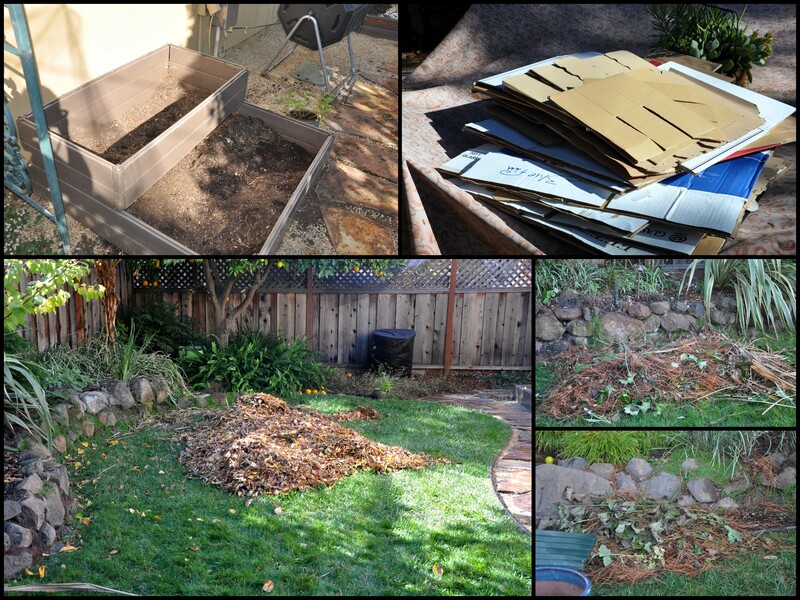 In preparation, I sheet-mulched half of the back yard for close to a year. 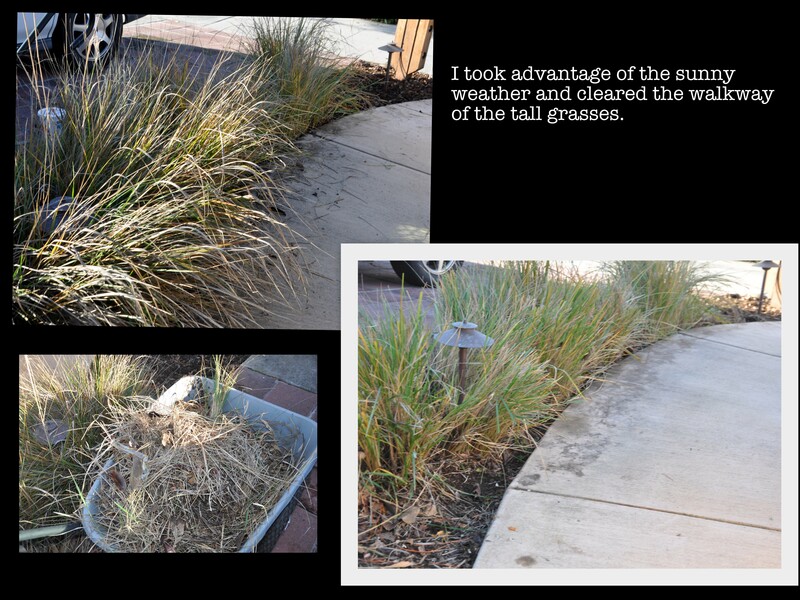 The process destroyed the lawn, amended the soil, and prepared the area for native plants, all at the same time. 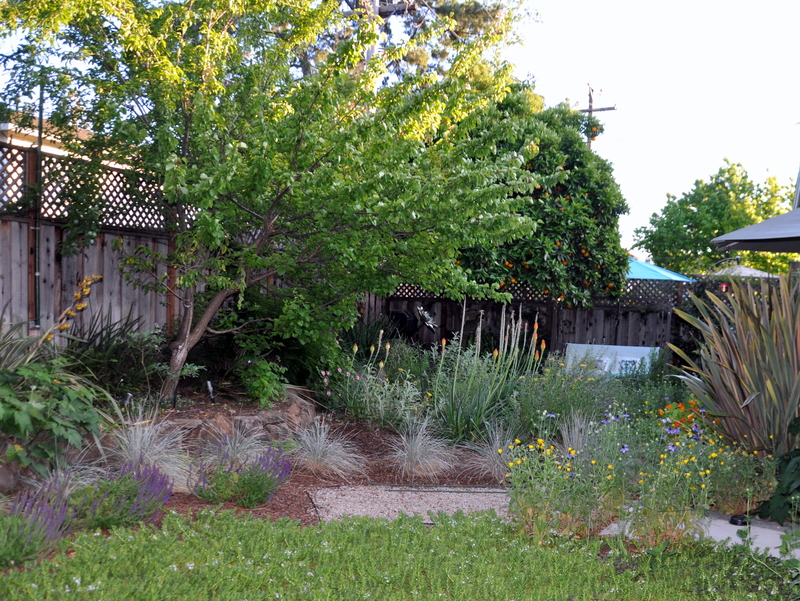 We replanted the entire area with California native and drought tolerant plants. 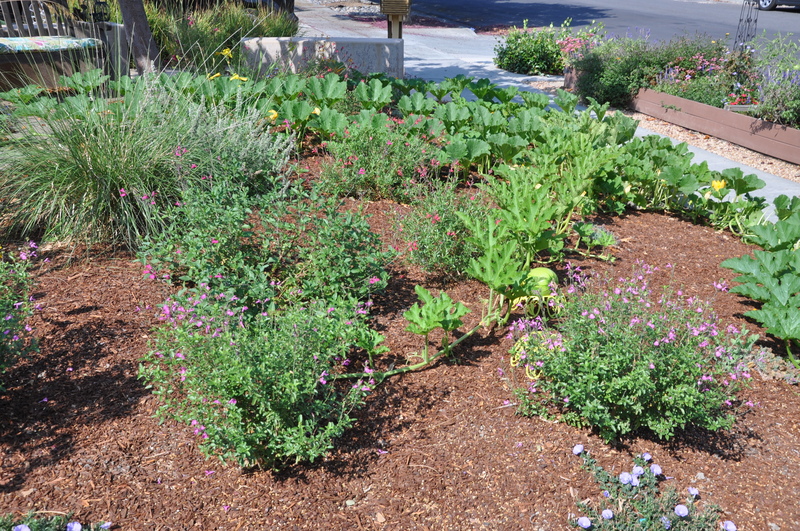 They use far less water than a lawn, attract beneficial insects and birds, and are healthier than the monoculture of a lawn. 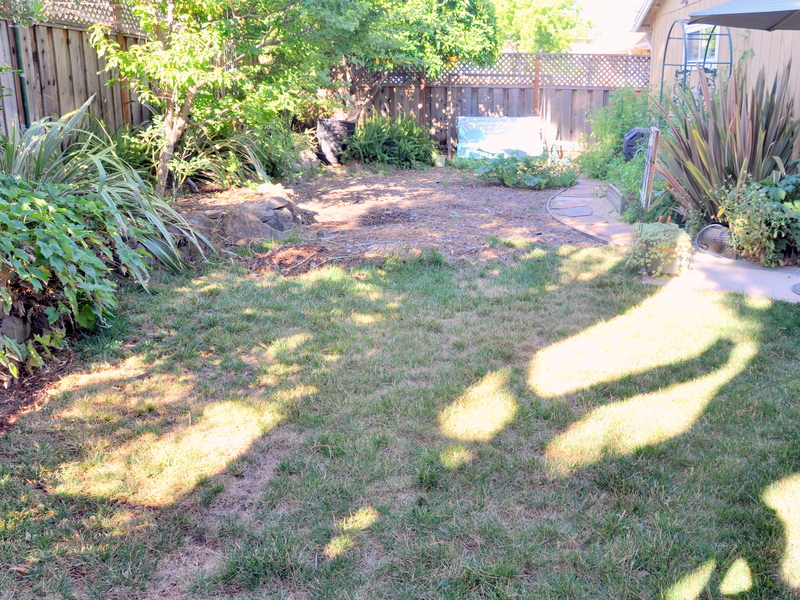 Removing the front lawn also brought about interesting changes. The act of turning the soil for native plants invigorated dormant seeds. 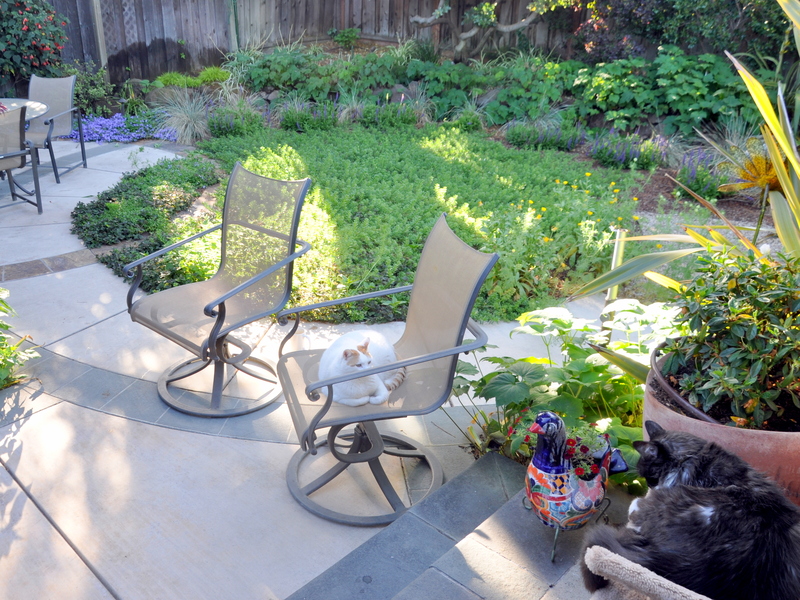 The year after the lawn came out, we not only had native plants but sweet peas, cornflowers, California poppies and Nigella. When the garden looked bare after the sweet peas went to seed, I hit upon the idea of planting pumpkin vines in their place. I’m enjoying the variety of successive planting. I smile when I see a neighbor through my kitchen window slowing down to look at the garden. 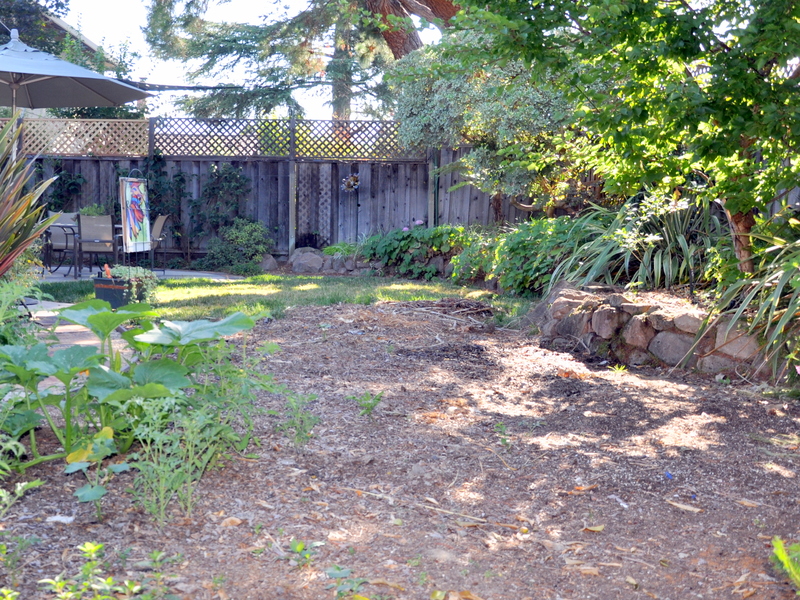 Tending a healthy garden means others can passively enjoy it too. Learning to love succulents has been another big change for me. One by one though, I’ve been replacing potted annuals with succulents. Succulents are well suited to our dry, arid climate. They get along well sitting in sandy soil. 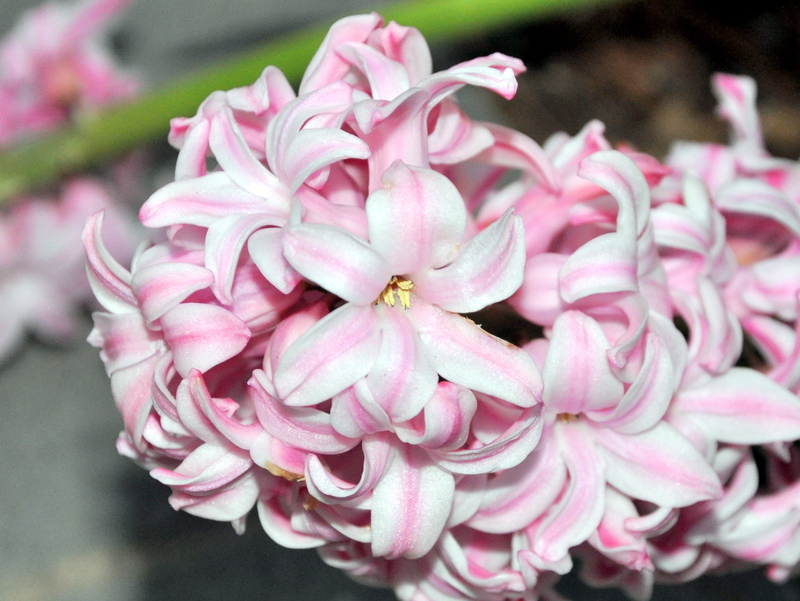 I water them sparingly, perhaps once a month, and in turn they reward me with color change and tiny blooms. 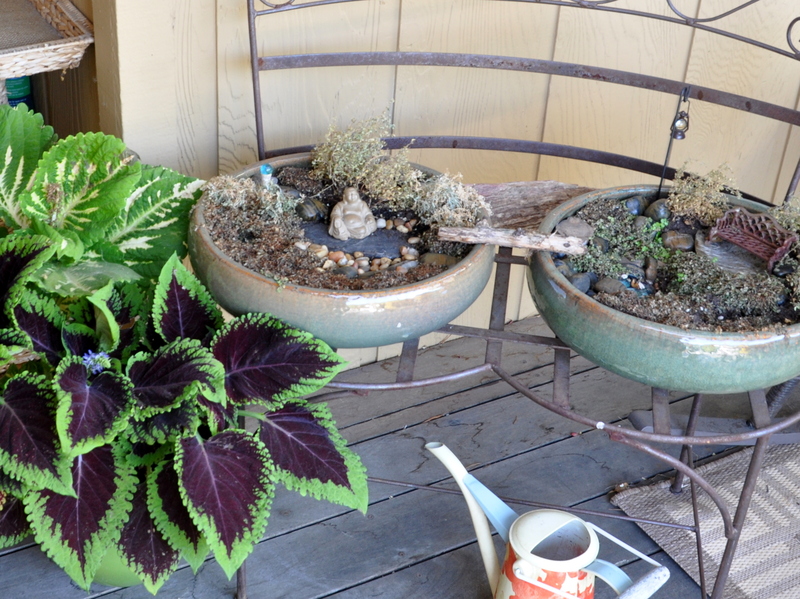 I planted a miniature peace garden earlier this year, only to see it collapse during a heat wave. The baby tears baked in the sun, even under the eaves of our house. I slipped out a few times to water the plants, but that tiny garden didn’t survive in the shallow bowl and the pounding sun. Since I refuse to embrace any metaphors about a dead or dying peace garden, I composted the dried plants and started over. This time I changed out the annual baby tears for succulents and added chamomile, which can go almost dry between watering. 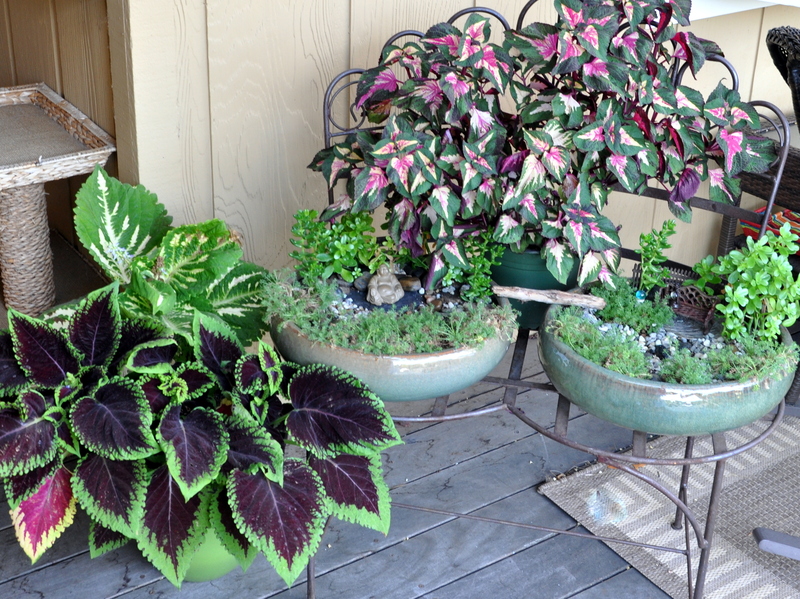 I shaded the entire mini garden with a coleus, my one concession this summer to a water-loving plant. I find the color variations irresistible. There is a twinkle of autumn in the air today, a reminder of the seasons ahead. My garden is a wonderful teacher, regularly reminding me that change is good. Are there interesting changes going on in your life? If you’ve been following along for a while, this will come as no surprise: I love pumpkins. I love growing them, harvesting them and finding creative ways to show them off leading up to Halloween. Mike takes over from there, carving extraordinary Jack o’ lanterns for the front deck. After growing pumpkins for a decade, I had two bad seasons in a row. Squash bugs infested my small patch the first year, claiming a few pumpkins entirely, forcing an early harvest of what remained. 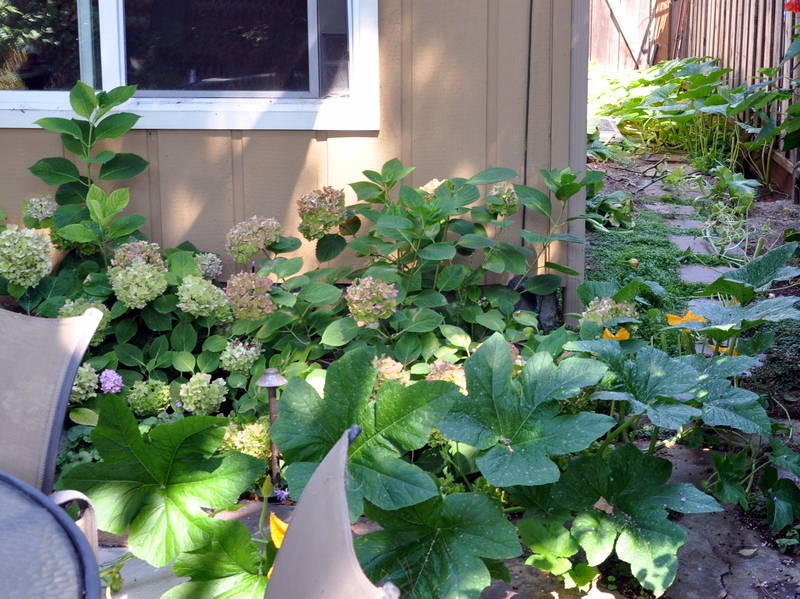 I relocated the pumpkin crop from the back garden to the front the following summer, but as soon as the plants fruited the squash bugs were back. Then the drought dragged on and I stopped planting them altogether. The pumpkin growing hiatus did the trick and sent those dreaded squash bugs packing. Further, I’ve now had a couple of self-seeded pumpkin vines grow without a single drop of additional water, at least from me. All the reading I’ve done says that pumpkins like warm, moist soil and lots of water. I learned last summer, though, that they can hydrate from the morning dew using their straw-like stems. Don’t you just love nature’s resilience? Late last year, after Halloween had come and gone, I did what any self-respecting gardener would do. I harvested the seeds, dried them and stored them for the winter. Instead of saving the seeds, I sent a “written invitation” to the neighborhood squirrels. What exactly does that look like, you ask? The first invitation was subtle. I placed a pumpkin in the center of the garden and carried on with my day. 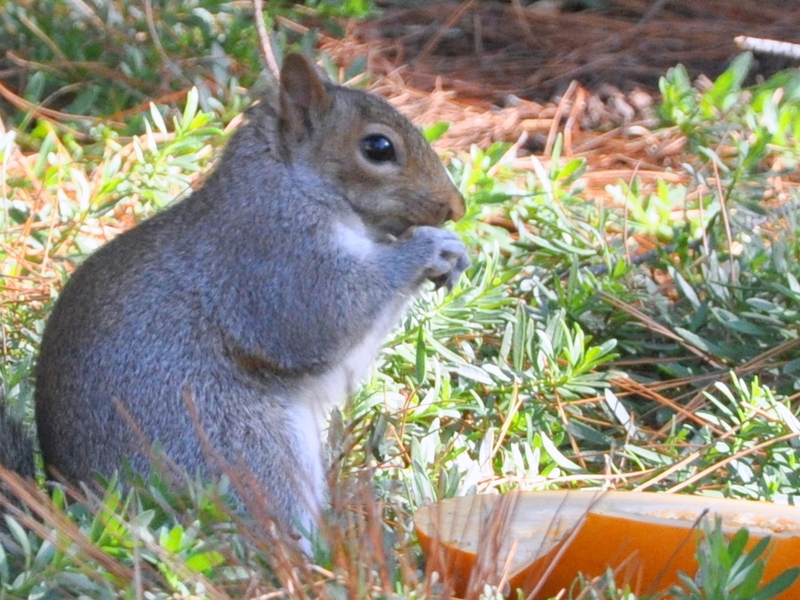 I glanced out the window from time to time, and sure enough, this cautious squirrel showed up for a meal. They don’t like the fruit or the skin, but there are plenty of other garden visitors to take care of that. It wasn’t long before it looked like pumpkin mush. The second “invitation” landed on the back steps in view of the sliding glass door. I kept the camera nearby and sure enough another squirrel came along and helped him or herself to the seeds. I love watching squirrels eat as they sit on their haunches keeping watch. Fast-forward to this spring, and I’ve got pumpkins growing throughout the garden. There are a couple of large specimens growing along the side of the house. As an aside, I removed three large flowering vines last year so we could replace the dilapidated fence. I didn’t want to replant anything till the new fence went in. Long story short, it will be October before it’s replaced. Meanwhile, the pumpkins showed up and off they grew. One of the pumpkin plants actually made it into a planter box and it’s also the first to produce fruit. It’s getting the best sunlight and moisture from a drip system so it’s doing well. There are three smaller pumpkin vines, struggling to take hold but refusing to give up. I’m just letting them be for now. The biggest surprise showed up in the last couple of weeks under our home office window. After freshening up the front garden after the sweet-peas went to seed, we replanted the area under the window with a gardenia and a few sunflowers. A week or so later, in the blazing heat I might add, I brought home 36 bags of redwood mulch and covered every bit of exposed dirt. We upped the watering to twice a week to help establish the new plants, and with that several more pumpkin plants arrived on the scene. I love checking on the vines each day, following the traditional progress of male flowers, then the female flowers and with good pollination, wonderful fruit. If our luck holds, and the rats, opossums and squirrels let them be, we’ll have carving pumpkins once again. We’ve had a reversal of fortunes so to speak, replacing six years of drought with one of the wettest winters in recent memory. 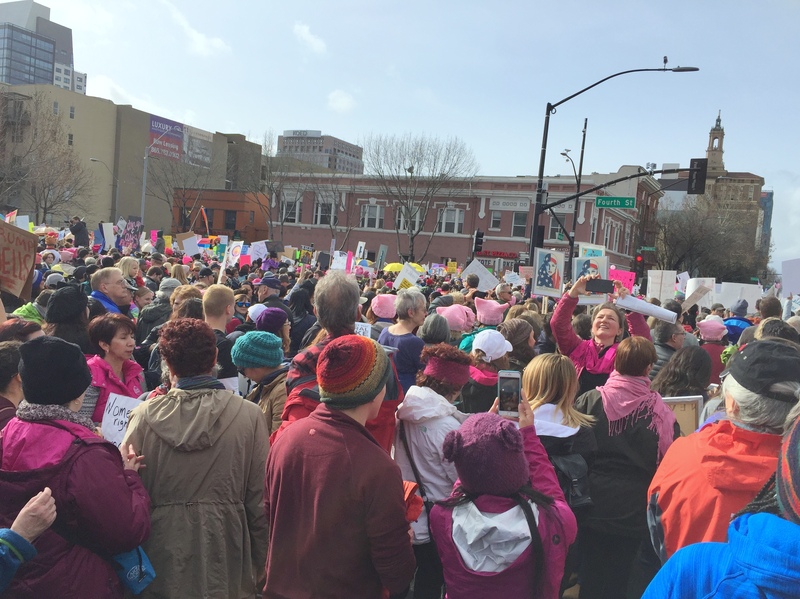 I’ve lived in the Bay Area for nearly fifty years, and I’ve never seen anything like this. As our reservoirs reached capacity in early January, we let out a collective sigh. The drought could now be viewed from the rear-view mirror. It kept raining. Then it rained some more. Powerful, drenching, atmospheric river styled storms, up and down the state. We had brief days of dry weather, followed by more intense storms. Mountainous regions about twenty miles south had two or three times the rainfall. Nearly 50,000 commuters travel the mountainous corridor daily between Santa Cruz and San Jose. Trees and slopes, barely hanging on after so many years of drought were suddenly deluged with water. This led to collapsed roads, devastating mudslides, falling trees and sinkholes. Flooded roads and lane closures have been a daily occurrence now for weeks. To our north, friends in Oroville have been dealing with a failed spillway. The Oroville Spillway serves America’s tallest dam. During a recent storm, a section the size of multiple football fields failed, sending water gushing off the sides and threatening homes along the Feather River below. At one point, over 180,000 people evacuated fearing the river would overflow, flooding homes and businesses along its path. My friend Barbara lives just above the Feather River, and has written her personal account Vegan Above The Flood Plane on her blog AtFiftySomething. Over the weekend, we’ve been closely monitoring the Anderson Reservoir, the largest in Silicon Valley. Due to seismic concerns, officials prefer to keep the reservoir at 68% of capacity. It reached 103% over the weekend, and continued to fill with today’s rains. I don’t know why San Jose didn’t order a mandatory evacuation. All the signs were there. I checked notifications from my couch all day, as I’m home recovering from a stomach virus. Then the worst happened. The water overflowed the banks along the river, forcing emergency evacuations. Footage shows fire fighters in neck-high water bringing residences to safety. The water is filthy, contaminated with everything in its path. Folks living in homeless encampments had to be rescued from trees. Heartbreaking. I’ve never been so grateful for a warm, safe, dry home. As soon as I’m well, I’ll be off this couch, finding a way to pay it forward. Our community has already rallied. 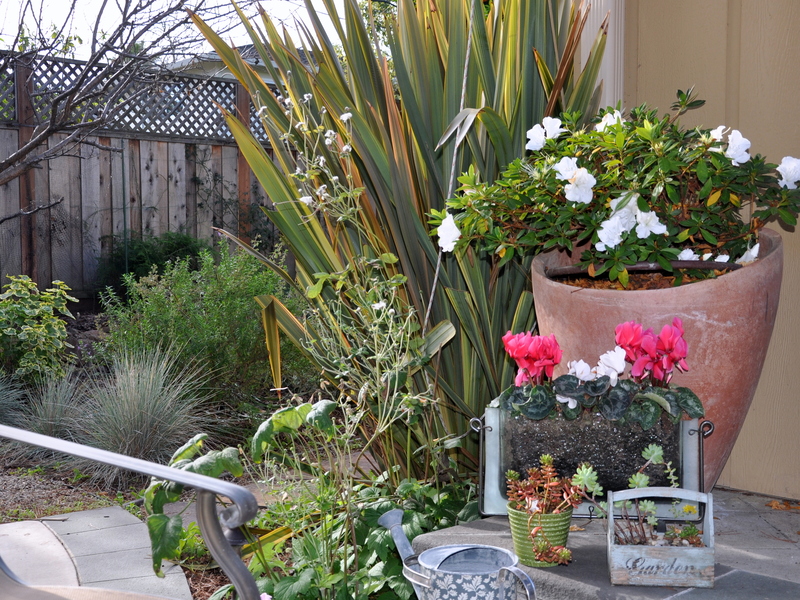 This rain-loving gardener has never been so happy to see a few days of sun in the forecast. I’ll share more as the news unfolds. 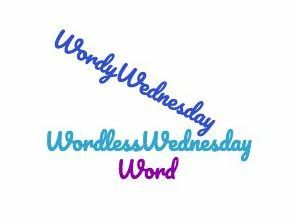 Are you familiar with #Wordless Wednesday? Bloggers, Twitter users and Instagram aficionados publish a single, captioned photo mid-week. Wordless…as in no words. Hmm. Either I lack the confidence to post a photo that I think should stand alone, or I simply have too much to say. I would like to propose a new hashtag called #Wordy-Wednesday. Of course “wordy” sounds like something my 7th grade English teacher might abhor. It could be #Words-Wednesday but that would probably just get shortened to #words. I wonder how many hits the hashtag #words might get in a day? The point is, I like to write, and I like to read what you write and I like to read the comments that you write when I write. 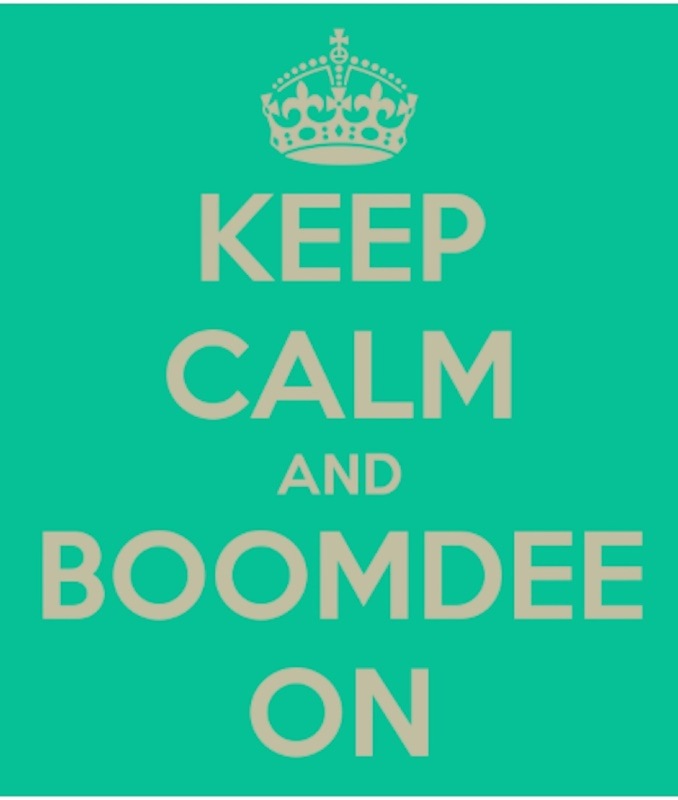 Here is my #Wordy-Wednesday. 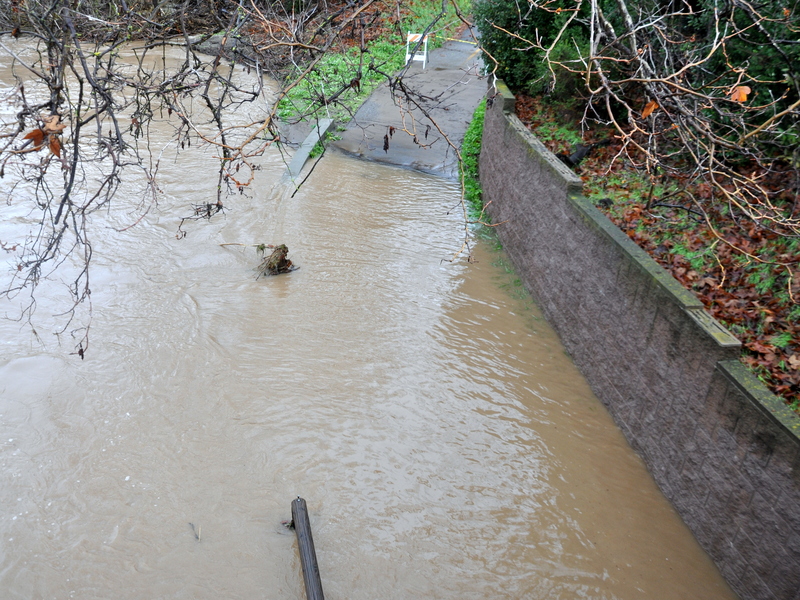 The atmospheric river is back, delivering more heavy rain in back-to-back storms. I headed over the hill (for the appointment I cancelled last month due to the storms) only to be thwarted yet again. The rain cleared for a few hours mid-day and traffic reports said I could get there in about an hour. Crews were clearing a mudslide, with one open lane. Then as I approached the area of the highway without any easy exits, traffic slowed to a crawl and then stopped. A second major mudslide lay ahead and there was nowhere to go. Close to an hour later, crews created a turnaround and both lanes of traffic slowly made u-turns going back in the direction we came. Nearly two and a half hours later I found myself back home thinking that perhaps I’ll cancel all of my over the hill appointments until late March. What a slog. The amazing news is that no one got hurt. 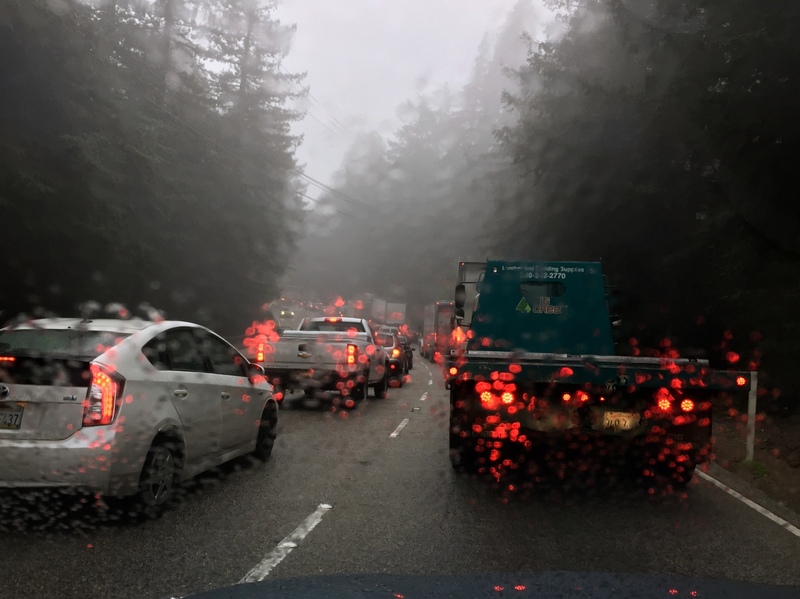 The massive slide dumped mud, rocks and trees along two lanes of the highway, lifting a man in his truck up and then over the side rails, dropping the truck upside down. The man walked away from the accident unharmed! Dozens of people worked over night to try to clear and shore up the area. They expect more slides today. Here is some amazing footage of a mudslide in action, taken from the dashboard camera of a police cruiser. If you click on the Facebook link, then scroll down to February 7th, you can see the video. Throughout the Bay Area, massive trees are down, homes flooded and at least one home split in two and slid part way down the hill. I’m grateful for the people who keep showing up for work with chainsaws, heavy equipment, and a can-do attitude. As January draws to a close I’m struggling mightily to find some equilibrium. 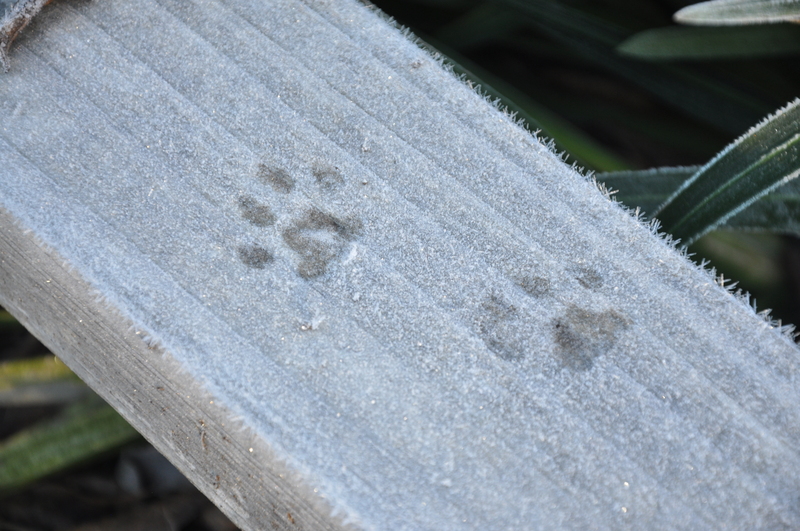 It’s been a month of cold and frosty nights. It burns off early, but some of our plants collapsed from the cold. 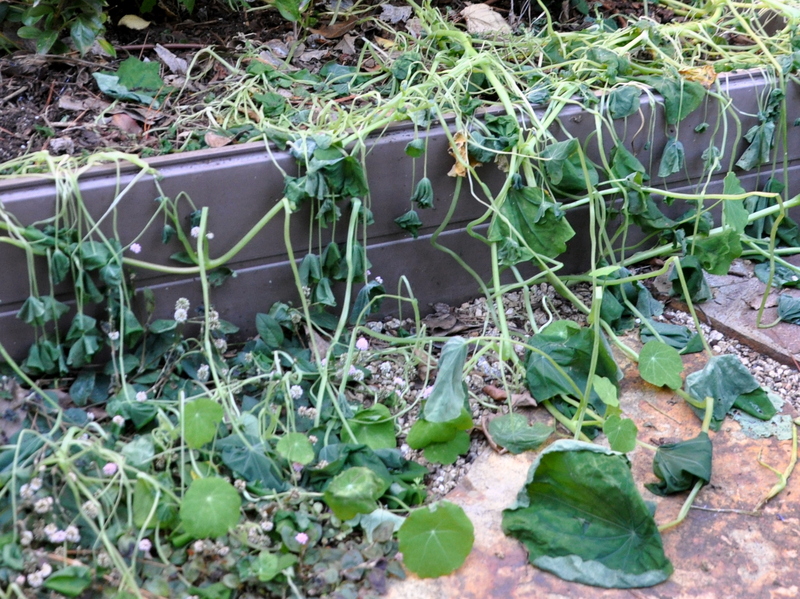 These nasturtiums bloomed last spring, died in the heat of summer, then self-seeded in late November. The frost did them in. It’s also been a month of rain. Cold days gave way to magnificent rain storms. It was too much all at once, but at the same time exactly what we needed. The sky opened up and dumped record-breaking rain on our parched state. The powers that be declared last week that the six-year California drought is all but over. Yesterday the temperatures climbed into the high sixties (19 C). A week of unseasonably warm days offered a much-needed dry out for communities with overflowing riverbanks and mudslides. Potholes turned into sinkholes, and the CHP humorously named one Steve. You can read about Steve’s short “life” as a magnificent sinkhole here. I’ve been raking pine needles, removing dead branches and gently pruning damaged leaves. And finally, it’s been a season of disquieting change. The country said goodbye to President Obama and First Lady Michelle. Obama the candidate campaigned on hope. Once elected, he brought intelligence and grace to the White House. Obama governed in measured and thoughtful ways, and his presidency was one of inclusiveness. When the US elected its first black president, it gave the rest of the world hope. The United States was not a racist nation after all! I still don’t know how we got here? January draws to a close in a season of hatred. Inexplicably, this country reversed course. We’re on a maddening and frightening path to the 1930s. I’m trying to find a balance between action and despair. It’s only about a week since the women’s march and I’m already feeling deflated. Pauline said it bluntly: we’ve elected a mad man. None of the rules apply.